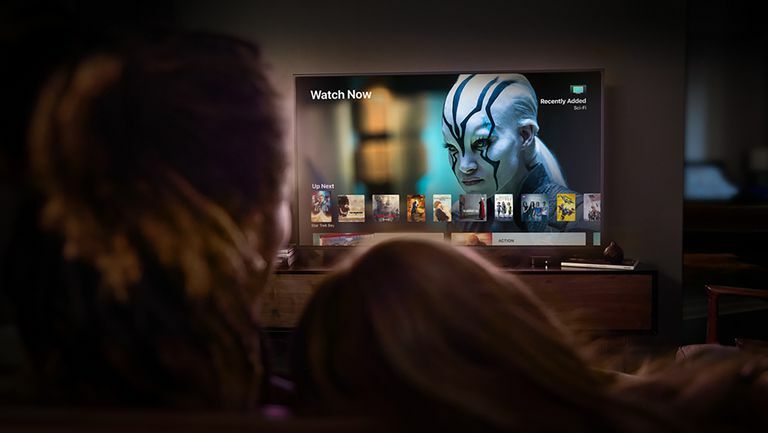 You may think you know what you can do with the Apple TV, but if your idea of the benefits of the Apple TV is mostly streaming video and audio, and maybe a little gaming, we've got great news for you. The Apple TV is packed full of awesome, hidden features. Here are 15 of the best things you probably didn't know you can do with the Apple TV. The tips in this article apple to the 4th Gen. Apple TV and Apple TV 4K, running tvOS 11 and 12. When you're looking for something to watch, don't search inside apps. If you use the Apple TV's universal voice search, it checks every app you have installed to let you know your options. The best part is that it might find a free way to watch the TV show or movie that you didn't know about! To find content this way, hold down the Siri button on the remote and say "Show me [the name of the thing you're looking for]." Select your item in the results that pop up at the bottom of the screen. On the search result screen, look for the Available On line beneath the description for your options. Click Open In to launch the video in your preferred app. With the Apple TV, you never have to miss mumbled or otherwise hard-to-hear dialogue. If you miss what one character says to another, just hold down the Siri button on the Siri Remote and say "what did he/she say?" The video will skip back a few seconds, temporarily turn on closed captioning, and boost the volume. Want to skip ahead in a movie or TV show exactly 102 seconds or go back 8 minutes? You can do it using Siri and the Apple TV. Just hold down the Siri button on the Siri Remote control and tell Apple TV what you want: "go back 2 minutes," "skip ahead 90 seconds," etc. Of course, this only works with streaming video, not live TV or sports. You might not know it, but a lot of the content available on the Apple TV — from iTunes to Netflix to Hulu and more — has optional subtitles available. To access subtitles, start watching any video and swipe down on the Siri Remote. Select Subtitles and then swipe across to the language you want. Click the remote to turn on subtitles in that language. Subtitles aren't the only options you can access this way. If you select Audio, you can control the spoken language of the video you're watching. You can also access audio settings like equalizing volume to reduce loud sounds, and chose the speakers the audio is being sent to, including HomePods. Forget needing multiple remotes to control different parts of your TV set up. If you've got an Apple TV, you can use its Siri Remote control to power parts of your TV. With the right settings enabled, the Siri Remote can turn on your TV, receiver, and Apple TV at the same time, as well as control the volume on your TV (or Sonos system, with a few small limitations). To do this, go to Settings > General > Remotes and Devices. First toggle the Control TVs and Receivers menu to On. Then click Volume Control and select the option you prefer (choose Auto if you're mot sure). With the Apple TV you can project your iPhone, iPad, or Mac onto your HDTV. This is great for viewing photos on a big screen, playing videos from your device, or giving a presentation. To do this, you need to use AirPlay Mirroring, a feature built into the iOS, macOS, and tvOS (the operating system that runs on the Apple TV). Make sure the Apple TV and the device you want to project onto the TV are connected to the same Wi-Fi network, and then read How to Use AirPlay Mirroring for full instructions. The Apple TV's interface is full of big, bright, appealing colors and images. But that isn't necessarily best if you're watching in the dark. In that case, you might prefer a more muted look. You can get it with the Apple TV's Dark Mode. Enable this and the design of the home screen gets darker and more appropriate for low-light viewing. To enable Apple TV Dark Mode, click Settings > Appearance > Dark (or Automatic, if you want the Apple TV to adjust based on time of day). If you want to automate your house with internet-connected smart home devices like thermostats, lights, and cameras, you need a smart home hub. The hub helps devices communicate with each other and lets you control them over the internet. For smart-home devices that use Apple's Homekit standard, you don't need a separate smart home hub — your Apple TV can play this role for you. To enable your Apple TV's smart home features, go to Settings > Accounts > iCloud > toggle My Home to Connected. The Apple TV supports all kinds of Bluetooth accessories. From keyboards to wireless headphones to game controllers and beyond, if you have a Bluetooth accessory, you can connect it to your Apple TV. Just put the accessory in pairing mode and then go to Settings > Remotes and Devices > Bluetooth > select the accessory you want to pair. If the device requires a pin to pair, enter it. Our personal favorite little accessory to connect to the Apple TV are Apple's fully wireless, completely tiny AirPods. Learn all about this option in How to Use AirPods with Your Apple TV. If you lose the Siri Remote control (or just hate the slippery little thing! ), you're not stuck: you can use your iPhone, iPad, or even your Apple Watch as a remote. For the iPad and Apple Watch, you'll need Apple's free Remote app installed (for the Watch, Remote needs to be installed on the iPhone the Watch is paired to). If you've got an iPhone running iOS 11 and up, Apple TV controls are built right into Control Center. Learn all about it in How to Control Apple TV with iPhone Control Center. If your Apple TV is part of a home theater system, you've probably got a universal remote that controls all of your components and don't want to be stuck relying on the Siri Remote (or iOS devices running the Remote app). You're in luck: You can use any remote to control the Apple TV. You'll need to help the Apple TV "learn" the options, features, and buttons of your universal remote. For full, step-by-step instructions on how to do this, check out How to Use a Universal Remote With Apple TV. The Apple TV's gorgeous, hypnotic screensavers pop up after a few minutes of the TV sitting idle, but you can force them to launch immediately using the Siri Remote control. To do this, go to the Apple TV home screen and move to the top left corner of the screen. Then click and hold the Menu button on the remote until the screensaver launches. The Apple TV makes a great addition to offices. Because AirPlay lets you project a computer or device onto the TV (see tip #10), the Apple TV makes it easy to give presentations on the big screen. When you put the Apple TV in Conference Room Display mode, the TV is available for anyone to connect to and use. With that mode, the TV shows a screensaver and instructions for how to connect. To enable this, go to Settings > AirPlay > Conference Room Display > toggle Conference Room Display to On. Just like an iPhone or computer, the Apple TV needs to be rebooted sometimes to solve problems. There's a menu in the Settings app that does this, but you can save a bunch of clicks by rebooting using the Siri Remote. To do that, just hold down the Home and Menu buttons on the remote at the same time until the light on the front of the Apple TV starts blinking. Then let go of the buttons and the Apple TV will restart. If you own more than one Apple TV, you probably want them to have the same set of apps and options, but who wants to download and arrange apps manually? With One Home Screen, you don't have to. Enable this option and all Apple TVs using the same iCloud account automatically stay in sync for the apps they have installed, how the apps are arranged, folders, and more. To enable One Home Screen, go to Settings > Accounts > iCloud > toggle One Home Screen to On.